Meet Ahsoka the White with This Star Wars Rebels Epilogue Cosplay « Adafruit Industries – Makers, hackers, artists, designers and engineers! McKenna, a.k.a. 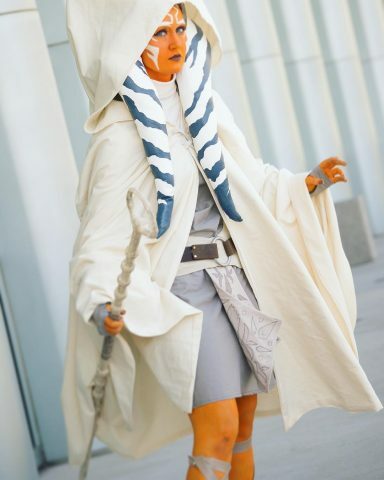 callmesnips on Instagram and Nine Lives Cosplay on Facebook, has cosplayed about every version of Ahsoka Tano you can imagine. She’s made Ahsoka’s costumes from Star Wars: The Clone Wars and Star Wars Rebels, including variations (like the dark version of Ahsoka from the Mortis trilogy) and costumes Ahsoka wore briefly. Given her history, it’s no surprise she was the first cosplayer to wear Ahsoka Tano’s look from the end of Star Wars Rebels. Keep up with McKenna’s work by following her on Instagram or Facebook.